“Old-fashioned” can have any number of meanings: a euphemism for stodgy, or a signifier of cutesy and intentionally low-fi, for example. But the landmarked pair of 1883 Greenwich Village luxury co-op buildings named Portsmouth and Hampshire at 38-50 West 9th Street are exactly that–old fashioned–with no hidden subtext and plenty of charm. Rich in pre-war detail with two working fireplaces (summer will be over before you know it! 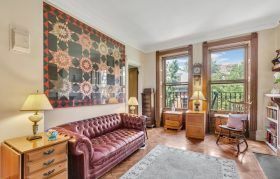 ), this one-bedroom apartment is up for sale for the first time in over forty years–and with the exception of important upgrades like a washer-dryer, and a $1.395 million asking price, it probably hasn’t changed much over that time.